I have had customers come in the store last week with pictures of chinook that they caught; it is a great year for chinook numbers and it already shows. 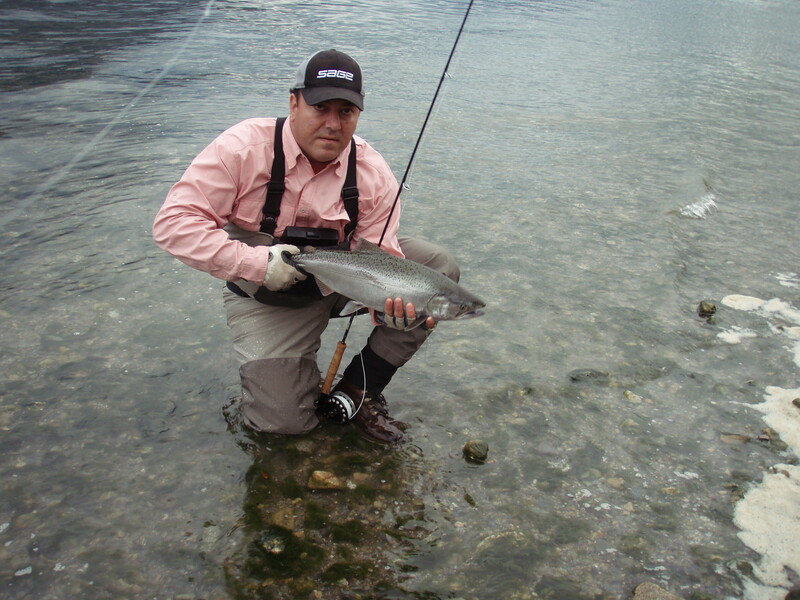 Use a cleartip or full clear sink fishing for these brutes as they swim a little deeper than other salmon. Try fishing streamers, wooly buggers and bait fish patterns and hold on to your rod if you get one on the end of the line as they will take off like a torpedo. The bigger coho are showing up now and will hang around until late fall or the first big rainfall. The pink salmon are toning down a little at Furry Creek as they are heading up the Squamish River but there is still a chance that you might hit one more schools of fresh fish. Andre with a nice chinook landed on the beach a few seasons back. Chinook, chinook, chinook. That is the key word this past week. The fishing for the chinook has been good most days, hot some days, and just plain ridiculous on other days. I can’t recall a season where I have had and heard of so many double-digit days for chinook. The hot areas have been changing daily as the fish move around constantly. The Bell Buoy, North Arm, T-10, and South Arm have all had their moments this week. We have had a lot of good days off the Bell and North Arm, I would say more than usual, so that is nice, as we don’t have to run so far. In fact we have only been down to the South Arm once in the past few weeks because the fishing has been so good around the North Arm. The hot depths on the riggers have been from 30 to as deep as 95 but for the most part 50-80 has been hot. Your favourite glow flasher and glow teaser head will get the job done. We have been doing very well on a green or chartreuse blade with silver tape on one side and glow tape on the other. On the deepest line we will often put on a double glow flasher with a green or chartreuse blade and this has been hot as well. Teaser heads that are glow, glow green, glow green chartreuse and glow blue green have all been hot. We are using green size herring or 5.25 to 5.5 anchovies. We have been going through 20-30 pieces of bait a day on the hot days as we are also getting lots of pinks and some coho are showing up as well. I ran out of bait the other day and put on a Pesca Bogart 4.0 (glow and green) and caught a nice fish immediately and also got a nice one on a glow white hootchy. So make sure you have lots of bait and if you run out put on your favourite glow spoons and glow hootchies and you will do well. Make sure to put some scent on the spoons and hootchies as this will affect your catch dramatically as these chinook are very sensitive to smell, hence bait being so effective. Steve, Joanne, Craig and Ronan after a great day on the water! The whales did come through on Wednesday night and Thursday so the fishing slowed a bit, but as I am writing this report on Friday morning, I just got a call from a friend who is 4 for 5 at the Bell and it is only 8:00 AM so looks like the fish are back. It doesn’t take much more than a day for the fishery to recover from the whales coming through as the fish are moving around a lot with the tides. A spot can be dead in the morning and on fire in the afternoon and vice versa. 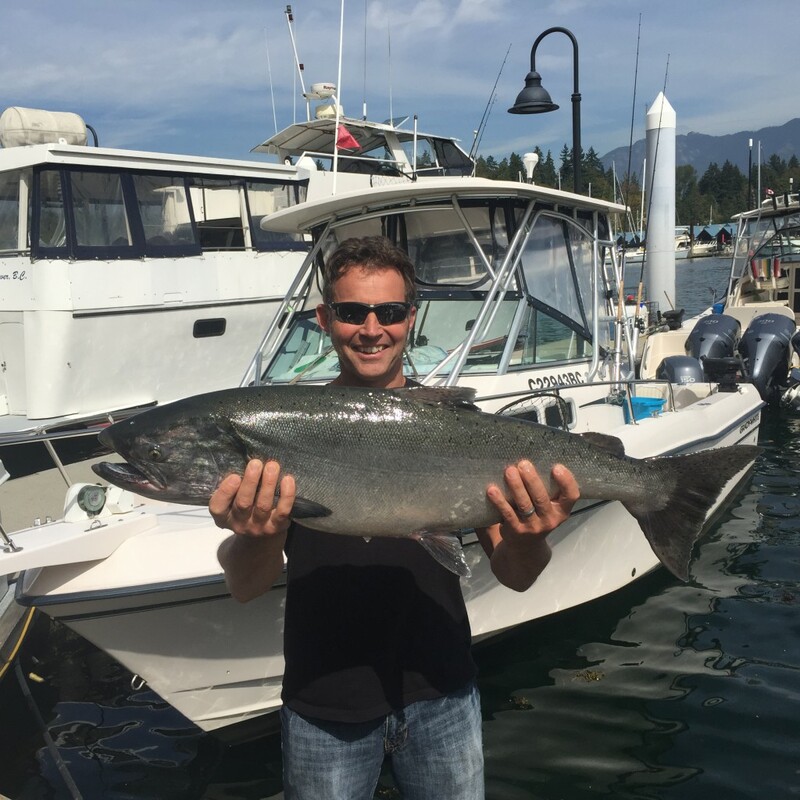 Warren’s guest with a beauty chinook! 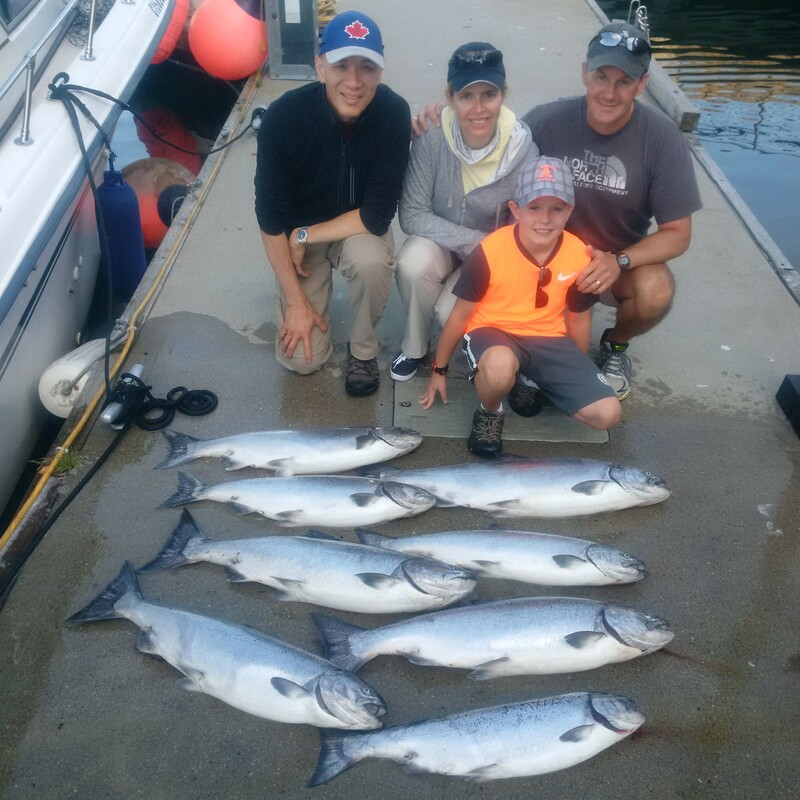 There has been a notable increase in white chinook this week and that trend will continue this weekend and into next week as the Cap whites, Chilliwack whites, and Harrison whites, start to move in. 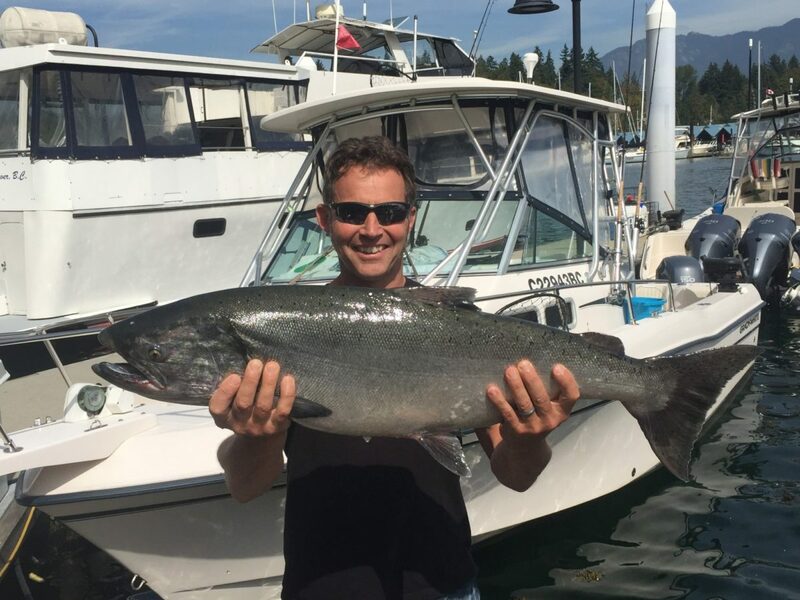 These are the big fish, with some 30 plus pound fish frequenting the Chilliwack and Harrison each year, so this is your chance to catch a big one locally. 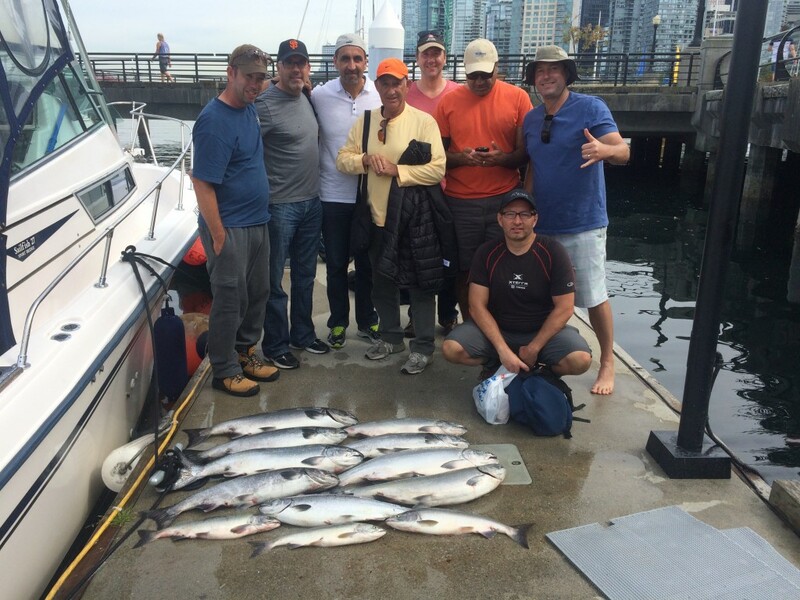 A great shot of Eddie + Dimitri’s guests with their catch! With all the hot chinook action off the Fraser Mouth, there aren’t too many boats fishing W. Van. The coho and pinks are still there and there are some chinook as well. Lots of our staff have been fishing the Cap Mouth with their fly rods from the beach or form zodiacs and they have seen plenty of chinook jump and go under the boat in the shallows. This rain might get them stirred up, so it could be a good bet to fish the Cap Mouth on the flood tide for coho and chinook. We will have to wait and see how hard it rains this weekend and if it will raise the river enough to get the fish up the river or for the dam to open up a bit. With 40-50 mm forecast for Saturday and 30-40 mm on Sunday, there is a pretty good chance the river is going to come up a lot and the fish will stack off the mouth and then move up.